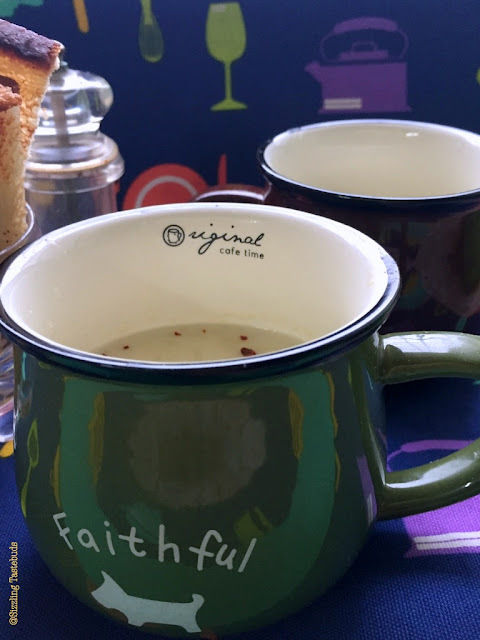 For this month of , I was paired with Shobana who gave me two delightful ingredients -Ridge gourd and Bengal gram for the Shhhh Secretly cooking Challenge with the theme "Chutneys". It was unusual to see that although we make it frequenty, I was yet to post this thuvayal. Thuvayal or Thogayal as its known in Tamil is different from the nomenclature of chutney in the sense that it has lentils , tamarind and vegetables as the base, in addition to coconut. 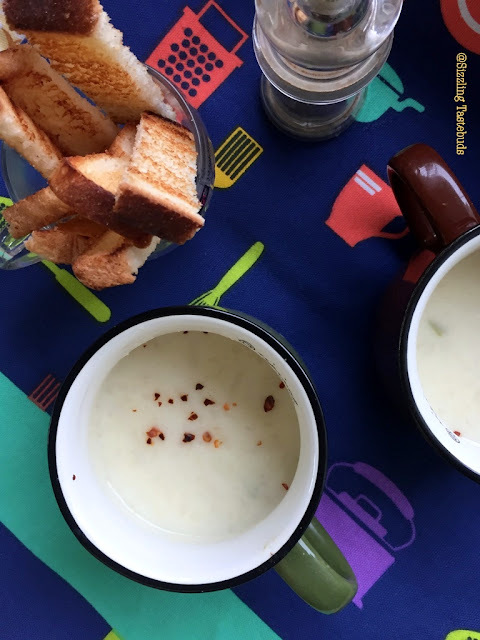 For dips with Idli / Dosa, check out more than 20+ varieties of chutney here. 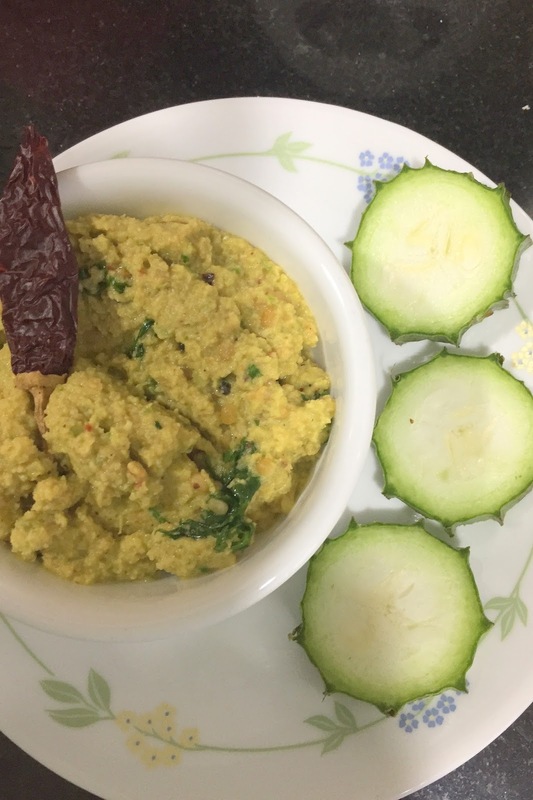 So, here's presenting a Vegan, GF dip to go with your dosa / Idli or even rice+sesame oil. Keeps for upto 3 days under refrigeration. Prep time : 15 mins, cook time : 5 mins, Serves : 3 generously. Handful of coriander leaves - optional but tastes great ! In a pan, heat 1 TBSP oil. Saute the dals one by one till golden brown, drain to a plate. Now add the tamarind, red chillies and the ridge gourd peels and saute on low heat for 3-4 mins till the peels turn slightly crisp (remove the chillies after 30 seconds, though). Cool, grind all the ingredients with adequate salt and very little water to a thick thovayal consistency. add a tsp of water if required to get all the ingredients together. Make the tempering with the mustard seed and curry leaves. Add to the chutney and serve. That's right - No fermentation, no waiting. 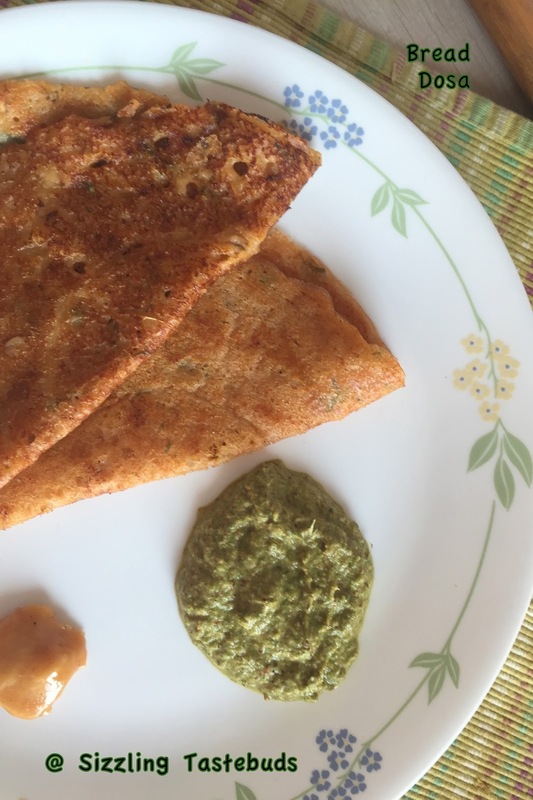 Instant Dosa for those 4pm hunger pangs or a quick breakfast / supper idea. This was a recipe I wanted to make the moment I saw it. Predictably, both my kids love most dosas, and this was welcomed for it was instant and super yummy ! They didn't even realise it had bread in it, and even after I told them, they didn't (couldn't) believe it. The only grouse was why did I make only 6 for 4 members in the family ! well, all in all - a winner and i love the fact that bread can be re-used in such an inviting form. Trim the edges of the bread. Blend into bread crumbs, add the sooji, rice flour, salt and mix well. Now add the curd and water and soak well for 20-25 mins. Blend it to a pouring consistency, add salt. Add a little more water to get a flowing consistency if needed. Heat the tava, drizzle some oil and brush with a soft cloth. Add minced onions and coriander if using. Take a ladle of batter and spread on the tava into a dosa. Drizzle little oil around the edges and cook till crispy on one side. 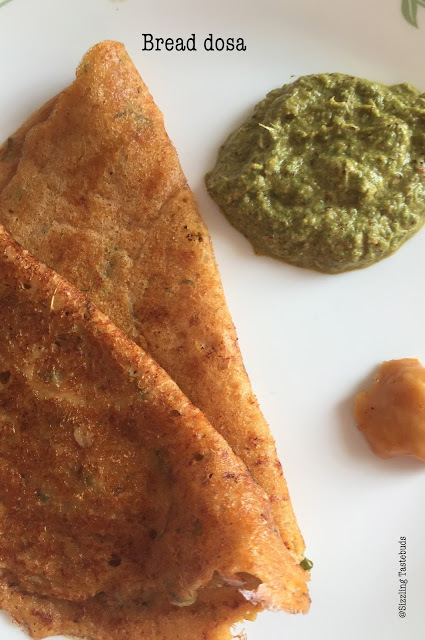 You can also stuff Potato fry into the dosa to make Masala dosa with the same batter. Dont let the batter become too thin or thick. 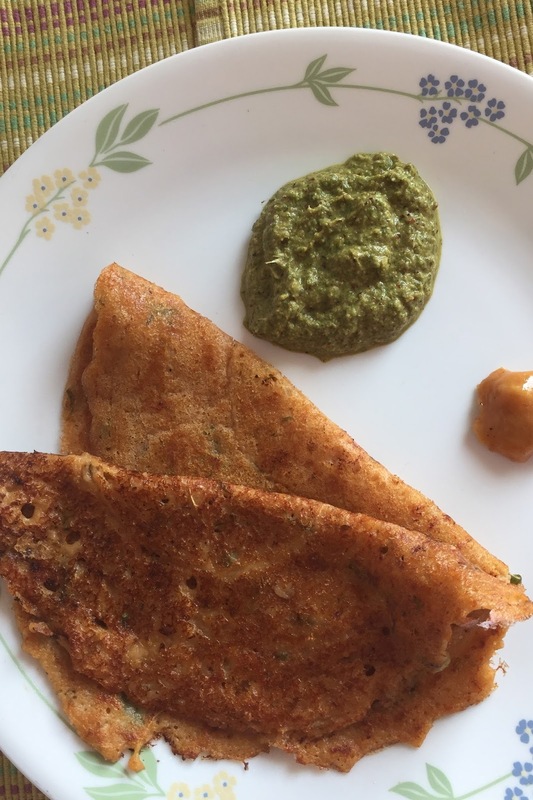 If needed, add few tsp of powdered oats to make a healthier version of this dosa. Sending this to BM 77 under "Secret Ingredient Theme"
Being part of #Breadbakers group has been a blessing to look at yeasted breads in a totally new light way - although breads (other than flatbreads/ stuffed breads with wholewheat) isnt our staple diet, the challenges so far has been a wonderful journey to learn new methods with unfamiliar ingredients , ogling at a few masterpiece creations, and learning a little more about sourdough breads, crumb and crust textures. I still struggle with the basic loaf bread (perhaps I haven't challenged myself enough), but our host Gayatri (a baker and a close friend is someone I have admired for over 4 years now - we have met twice as part of another group !) has asked us to make braided breads for June. Trust me, I just hopped into the challenge, and even typed my yet-to-be-baked bread as my entry. And then the jitters started. 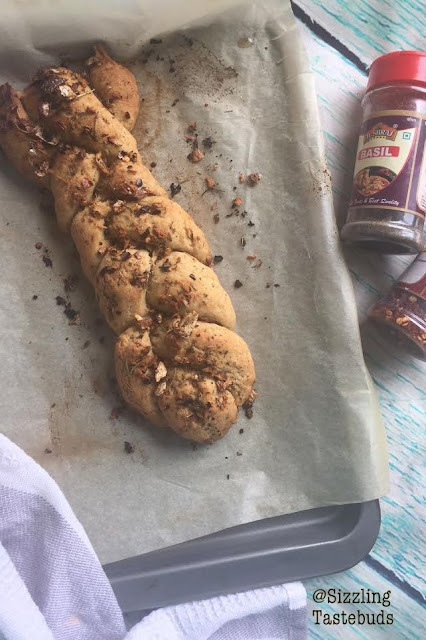 And then I HAD to do it - there was no way I couldn't back out from a challenge I had entered into :) Thanks to the push, here's my basic bread dough transformed into a beautiful garlic braided bread - yes the finish could be better, but am glad I could make it. 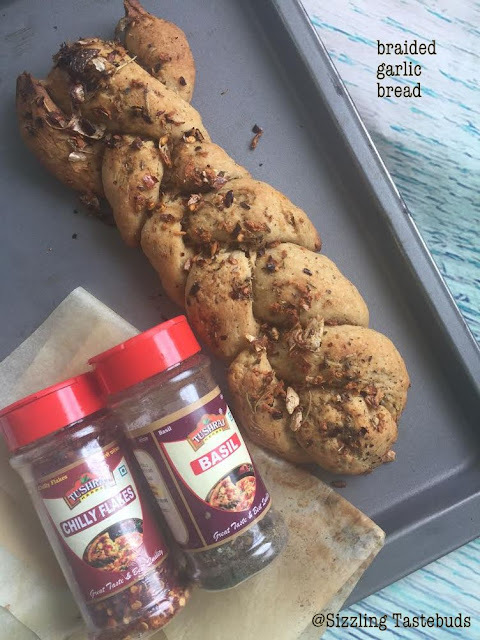 Garlic is one of our most preferred flavours in bakes - as is evident in roasted garlic focaccia , Cheese garlic bombs (both incidentally baked for Breadbakers) & Coriander Garlic Pull apart rolls. 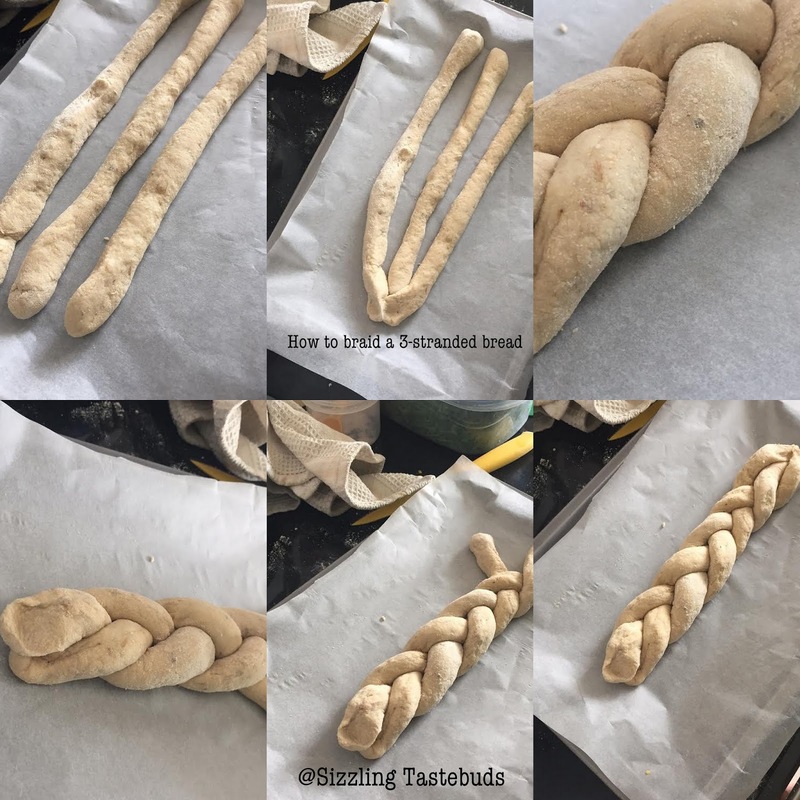 It was easier than shaping the perfect loaf, so I shall definitely be making more braided breads - it makes for such an elegant centrepiece at the table. The girls devoured it one early Sunday morning, and the next time I shall serve it with some soup. Prep time : 20 min, Rise time : 1 hour + 45 mins ; Bake time : 22 mins. I used a frozen portion of my bread dough, Thaw the frozen dough to room temperature. But if you want to make a fresh batch, please do so. If using fresh dough, let it proof once till doubled. Once done, punch down a bit & proceed to the next step. Heat the oil a bit and immediately add the crushed garlic. Switch off. Add a dash of chilli flakes and salt and let the flavours seep into the oil. Knead once on a lightly floured surface. Cut out three equal portions of the dough. Pre heat oven to 375 F / 190 C. Prepare a baking tray with parchment paper. Roll the portions of the dough into thick ropes. Place the ropes held together at the top on the baking pan directly. Braid the bread as shown in the pictures. lightly brush the bread with the flavoured oil. Towards the end of the second rise, preheat oven. Let it cool a bit and slowly cut into pieces and serve. 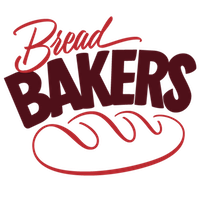 This month's Bread Baker's theme is Braided Breads and is hosted by Gayathri Kumar of Gayathri's Cook Spot Here is the collection of all the beautiful braided breads from our team. Two-Seed Potato Challah by What Smells So Good? Soup is one dish that's always welcomed. Though for me, its welcome if someone else makes it :p . There was once a phase early this year when Cauliflower was resented at home. Perhaps we had too much of it in the winter - Gobhi Matar, Baked Gobhi Manchurian (how can ANYONE have too much of that ?!!) , Gobhi Paratha. Anyways, you get the drift. 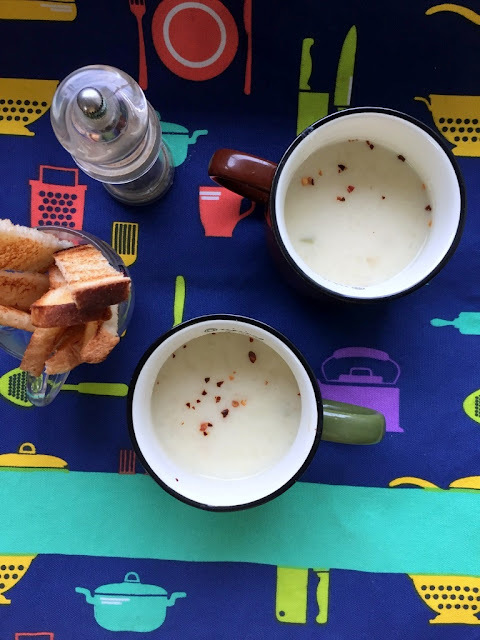 I had to devise ways of using up the cauliflower florets, and knowing my kids would love soups for their afternoon snack, made this one cold chilly day. The elder one lapped it up, although the younger one stuck to soup supposed to being either made of Tomato or Beetroot. 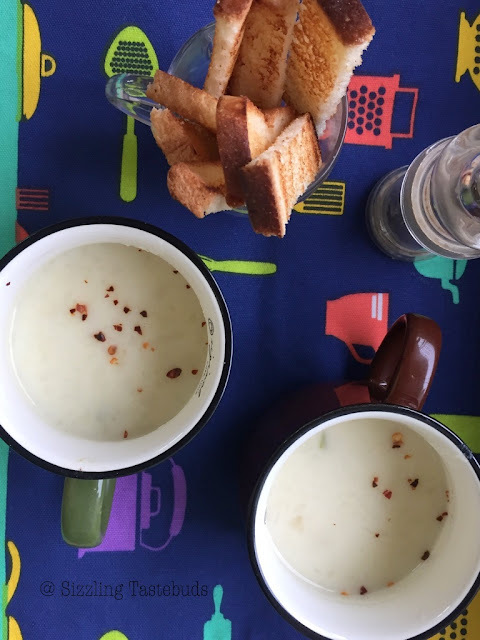 Either way, I had one more variation of soup added to the monthly menu, and couldn't be happier. 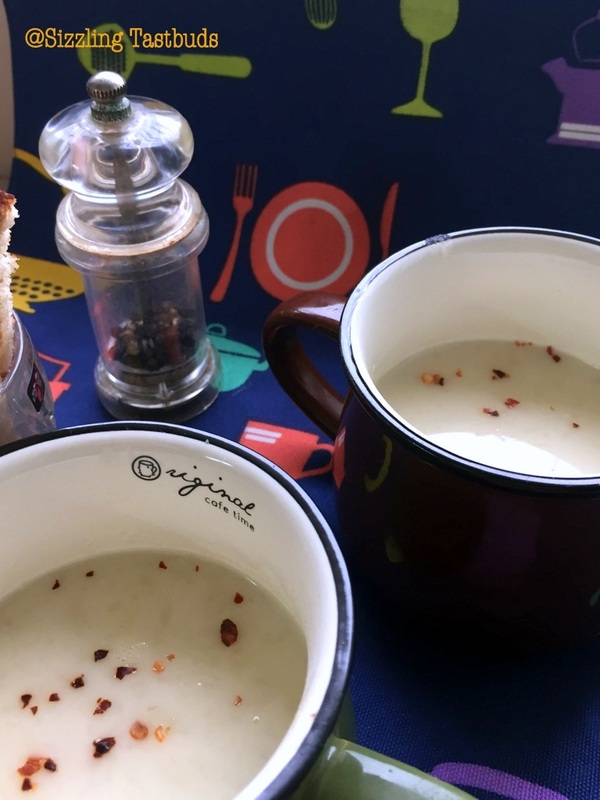 If you are fond of soups, do check out more than 15+ varieties of soups here, including a curried cauliflower-lentil soup. 1) This can be made vegan too - check recipe and notes below. In a pan, add oil. Saute the bay leaf, onion and garlic till pink and translucent. Add the ajwain,cauliflower and salt. Add half of the hot water and cook covered. Return the puree to the pan, on medium heat add the milk and the remaining water and whisk thoroughly. Let it simmer for 4-5 mins. Check for salt and spices - top with chilli flakes & crushed black pepper. Serve hot with croutons / breadsticks or any bread. We had a very interesting theme to choose for July - Secret ingredient. And am glad I chose it for this week. 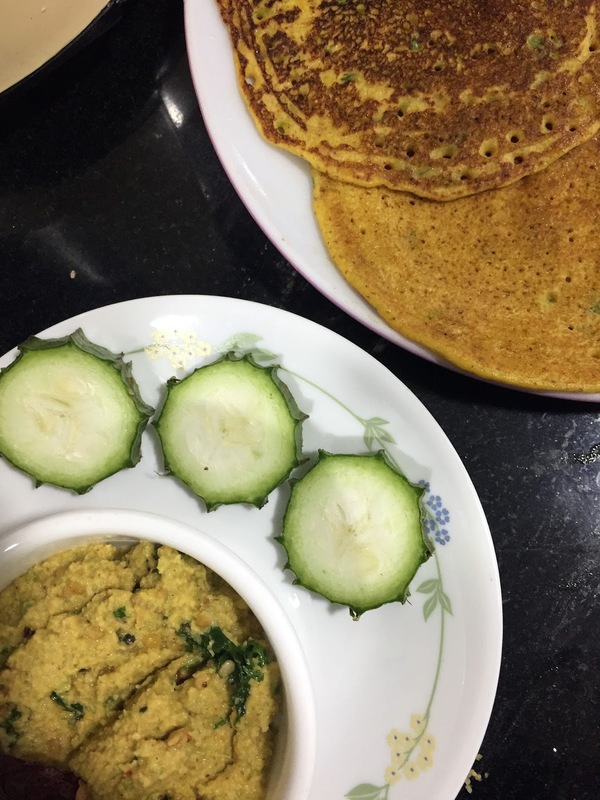 We have our pet peeves in the family about foods we don’t like in their naturally presented form (for me, its bitter gourd / Karela). For some time, both my kids refused potato (yes!!! just imagine :D). 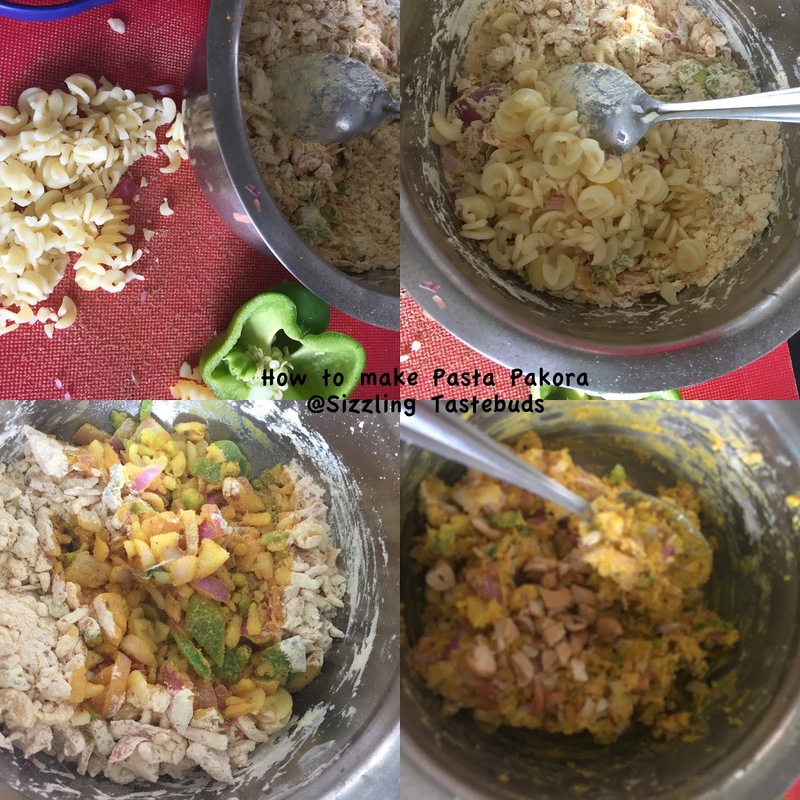 The first in the series is Pasta Pakoda - yup, a LOT of pasta was cooked and we used a large portion for the Main course (we made 3 - pepper pasta in White Sauce). I am not too fond of pasta and mom would never eat it. So, go on, surprise your family / guests with this delicious treat ! Drain all the water from the pasta and refrigerate covered for 1-2 hours (overnight cooked pasta works best) - chop it fine into fine bits. In a large bowl, sieve both the flours with turmeric. Add the red chilly powder, ginger / chilly , coriander and mint leaves and mix well. mix everything well. Add onions, crushed dry spices, and half the salt and mix well with your fingers. Now mix well and sprinkle very little water (remember pasta is cooked and contains water as well) to make a stiff and slightly sticky dough. Meanwhile heat adequate oil for frying. Check for salt and spices once more. Pinch out small portions and fry in oil on medium flame so its cooked to golden brown evenly. Drain on absorbent paper / kitchen towels and munch them with a cup of tea / coffee as an afternoon snack. Pasta has a lot of water, so drain thoroughly before use. Chop the pasta into tiny bits before adding to the dough. upon cooling / refrigeration, if the cooked pasta has any crust / skin formed, remove out the hard crusts and then use the softer portion, else you would have stone hard pakodas. 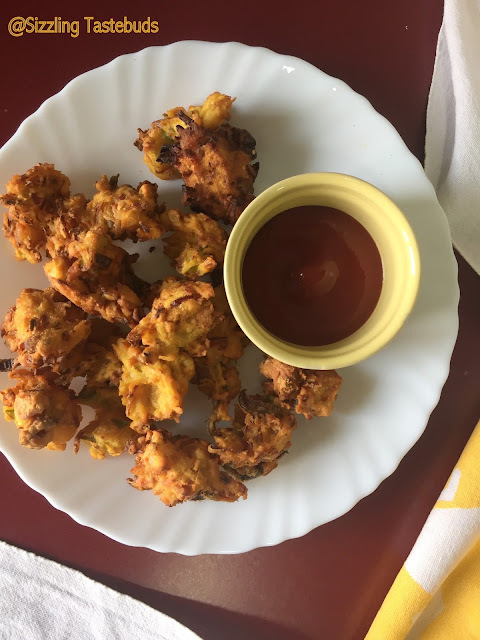 Fry on medium heat only, as the pakoras contain carbs from the pasta, they burn and blacken very fast on high heat, but may remain uncooked inside.